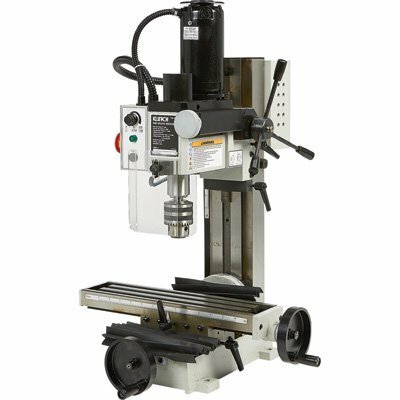 For a long time, milling machines have only been in use in large industries but thanks to technological progression throughout the years, there are now mini mills that are usable in our homes and other small workshops. Mini milling machines have brought the capabilities of the industrial milling machine to our homes, and are therefore some of the best investments you can make as an entrepreneur. Due to the ever-growing demand for advanced mini-mills, many companies are competing to produce the best in the market which has led to an immense variety of choices making it difficult to determine the right one for your needs. To help you make the right choice, we looked into all the features that an outstanding mini mill should have. Keep reading this article, and by the end of it, you’ll have found the one that fits you best. It has a 9.5 X 31.75-inch worktable making it one of the mini mills with an extra-large worktable for easy handling of big objects. The size of the table allows for wide x and y movement which lets you work on huge objects without any major adjustment after every cut or drill. It also features a built-in work lamp which is very useful for illuminating objects contributing to more accurate cuts. This JET JMD-18 has a massive 230 volts, 2hp motor which ensures that you do your work swiftly. The motor features a speed control module of between 15 to 3,000 RPM which you can adjust in 12 increments. This gives you control over the power you want to use when working with different materials. The JMD-18 is one of the most potent mills considering the massive 2hp it has and the RPM. This makes it suitable for both soft and heavy-duty projects. 360 degrees swiveling head increases the flexibility of the mill allowing you to carry out angled cuts which are otherwise impossible to achieve with some mills which don’t have adjustable columns. This mill has a cast iron column to strengthen it and increase the mill’s stability in general. The increased weight also ensures that there no vibrations when working on your projects. Proxxon 37110 features a 110-120vlt, 1/8HP motor. The motor has adjustable speeds of between 5000-20,000 RPM making it quite robust. The high RPM makes the mill quite powerful for use on hard objects, but because it lacks a low RPM, it doesn’t provide low-speed cuts necessary for carrying out soft projects. It has a small worktable of 7.875 X 2.75 inches which makes it perfect for handling small objects. Its base is composed of cast iron allowing it to support heavy objects. The heavy cast iron base also makes the mill stable enough to avoid any significant vibrations that would otherwise cause hindrance during milling or drilling. Even at very high speeds, the 24-pole balanced motor is very steady allowing you to make precise cuts on your objects. This mini milling machine comes with a 3/4hp, 110 volts vibration free motor. With a vibration free mill, you can make precise cuts effortlessly. The motor has a 2-speed gearbox for adjustable speeds that produces 350 watts of power. It has between 100-2,500 RPM which is okay for carrying out small to medium projects. The RPM and horsepower combination produces enough force to make quick cuts, although, hard objects might take a while due to the low RPM. Its worktable is 3.625 by 15.375 inches supported by a cast iron base for handling heavy objects. The heavy base is an added advantage as it helps prevent vibrations when working. The size of the worktable allows x and y movements suitable for handling medium projects. The mill has coarse down feed control for drilling and a fine downfeed control for milling. The feed control allows you to work with the right speed and power for each task. The Erie mini mill has an average motor power of 150 watts. The motor has a variable speed ranging from 0 – 2,000RP. With such RPM, one can make swift cuts on soft to medium objects smoothly but takes a while to cut hard objects. This mill is made explicitly for heavy-duty drilling and milling. It has a 9.45 by 5.7-inch worktable which allows working with small objects. It can handle tough cuts although it will take longer due to the medium range of RPM and torque. It also has inbuilt safety features including a guard on the spindle and a safety shut off switch. The guard found on the spindle is meant to ensure that drilling/milling debris are not thrown all around as they can cause injuries. The mechanical intrigues of this mill are on another level as the mill is capable of handling extreme cuts without experiencing technical difficulties such as an overheating motor. The SUNWIN mini mill has a 12V, 2 amp motor producing 24 Watts. Its motor has a speed of up to 20,000 RPM and a headstock speed of up to 2,000 RPM. This makes it fit for small DIY projects which do not require much power. It has a small worktable and a carbon steel base. Carbon steel is not as strong or as heavy as cast iron. This makes it suitable for handling small and light objects only. According to most reviewers, it’s great for carrying out hobbies and not for heavy duty activities. The high RPM of the motor allows for quick swift cuts, but it’s not powerful enough for hard objects. 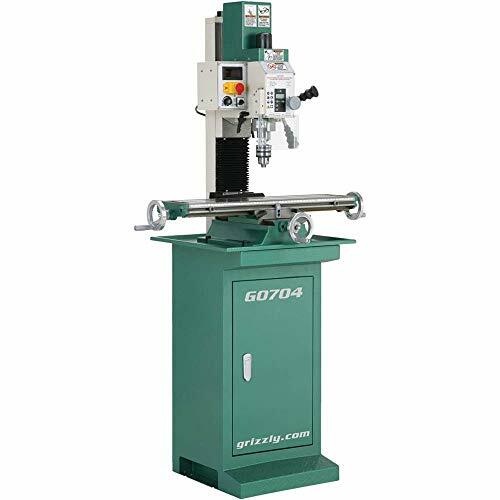 #6.Grizzly G0704 Mini Milling Machine. The Grizzly G0704 is both a drill and a mill with a 1HP, 110V motor producing 3.2Amps. The motor has a 2-speed gearbox for adjustable speeds. The G0704 horsepower is strong enough to handle heavy-duty projects which require proficient accuracies. This mill has an R-8 spindle taper for wider availability of tools. The head slants 90 degrees to the left and right enabling you to carry out angled cuts. The spindle has an adjustable speed of between 50-2,250 RPM. With such speed and horsepower, one can carry out swift cuts on a wide variety of objects. Its worktable is 7.0625 X 26.625 inches which makes it one of the few mini mills with a large worktable. The table is made of cast iron for handling heavy objects. The large table allows for more x and y movement when working making it easy to drill without readjusting the objects now and then. The mill has a safety shut off switch and a guard on the spindle which offer protection when things go wrong during milling or drilling. The motor has an automatic thermo-switch which turns the machine off when it starts overheating to ensure the mill’s protection. Just as in a large scale mill, Grizzly features a dovetail column and DRO on spindle making it an excellent mill. The dovetail column enables a stable z-axis movement. OT2213 is a small mill with the capabilities of most large mills. It has a 1/2 HP, 110V motor with 2-spindle speed control which lets you work on a wide range of objects at the right torque. The spindle speed varies from 0-2,500 RPM, and the head can tilt 45 degrees to the right or left providing you with more accuracy when making angled cuts. Considering how low the OT2213 RPM is, it makes it perfect for cuts requiring slow speeds. It also has an R-8 spindle taper for extensive tool compatibility. Its worktable measures 15 by 3.5 inches. It’s good for small to medium-sized objects and can also handle heavy objects because the worktable and the base are composed of cast iron. The heavy base reduces the vibration of the mill contributing to easy and precise cuts. The mill also features a fine feed control for milling and a coarse feed control for drilling. The feed controls are useful as they let you run the drill depending on how coarse or soft the material you are working on is. 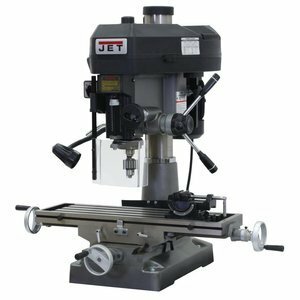 The JMD-15 has a 1HP 115/230V motor which provides enough power for both drilling and milling. It’s supported by a cast iron column which makes it sturdy and stable. 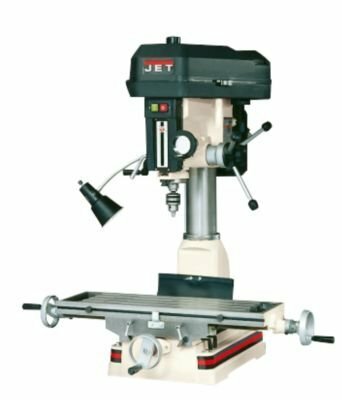 With such horsepower and reliable cast iron support, the JMD-15 is capable of handling most milling and drilling tasks. Its 360 degrees head swivel makes it easy to carry out cuts on the 7.5 by 23-inch worktable. The large worktable allows for longer x and y movements during drilling and milling. It has 12-spindle speeds which are adjustable between 110-2,580 RPM. Although it doesn’t have low RPM, it can be adjusted to produce low torque suitable for handling softer objects. The JMD-15 has a quick slide latch which allows quick belt adjustments to alter spindle speeds. It also has a work lamp for illumination during milling or drilling making it easier to make precious cuts. It’s fitted with a drill chuck guard to safeguard you from drilling debris. The mill also features a quick stop knob to halt the mill from further drilling or milling when it meets the required status. 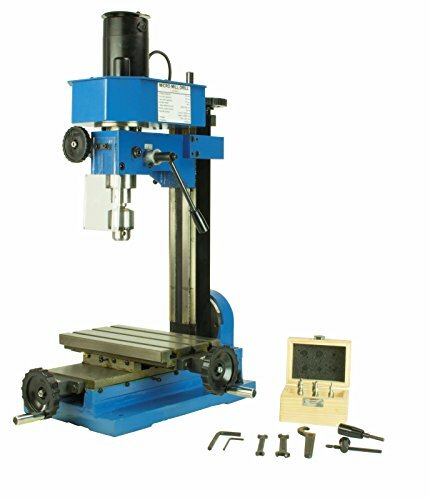 The M1111 milling machine has a brushless, 1HP, 220V motor with a step-up transformer. It has an R-8 spindle taper, and the spindle can travel 2.75 inches. With such a powerful motor, the mill delivers enough torque to help drill through objects faster. The motor produces variable speeds of between 100-1,750 RPM which can be adjusted using a push button located at the end of the rack levers. This makes it easy to switch between different RPM saving you a lot of time. The exact speed of the mill is displayed by a backlit digital tachometer which also advises you on the correct speed used for specific materials and tools. This makes it useful especially for milling newbies as they don’t need to keep looking up the right speed required for each material they are working on. The column tilts up to 90 degrees on either side. This makes some cuts which would otherwise be impossible to make very easy. The M1111 has a cast-iron 6.25 X 21.625-inch worktable which makes it suitable to handle massive and heavy objects. The cast iron base and table also helps reduce vibrations which would otherwise cost you a lot of time trying to make precise cuts. The CNC 3018-Pro is a milling machine used for engraving objects using the GRBL software. It has an engraving area of 30x18x4.5cm which can hold up to medium-sized objects. The large engraving area also allows more x and y-axis movement when working. 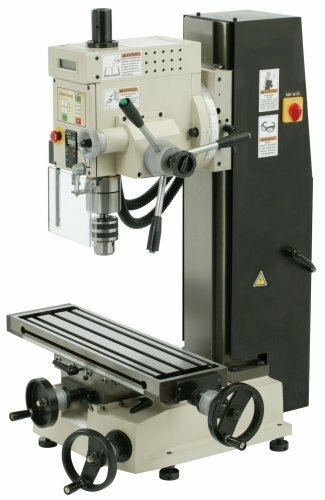 For those who are new to mini mill machines, CNC machines are Computer Numerical Controlled machines which run on computer software to make more precise engravings and cuts. It has a 775 spindle motor (24V) and a 12V stepper motor. The 3018-Pro supports Windows XP, Windows 7, Windows 8 and Windows 10. CNC milling machines are automatically picked up as mass storage devices, and so the CNC 3018-Pro is immediately recognized when connected to compatible devices. One of the best features of this miller is that it can work offline, i.e., you don’t need to connect it to the computer as you can manually set the engraving points. It also comes with preinstalled software in T-cards or USB drives for some most popular engravings which can run offline. The CNC 3018-Pro can only engrave simple materials such as PVC, wood, plastic, and PCB. The support structure of the CNC 3018-Pro is made of a combination of durable plastic and metal parts. This structure can support the machines power and simple objects when working. 1) Power: when deciding to take mini mill, always consider the power vs. its intended use. Buy a mini mill machine that won’t heat up quickly every time you start working on your project. More power means less time taken to carry out each project which in turn increases your production capacity. 2) Size: the size of the machine is one of the biggest considerations when deciding on the mini mill machine that you should purchase. 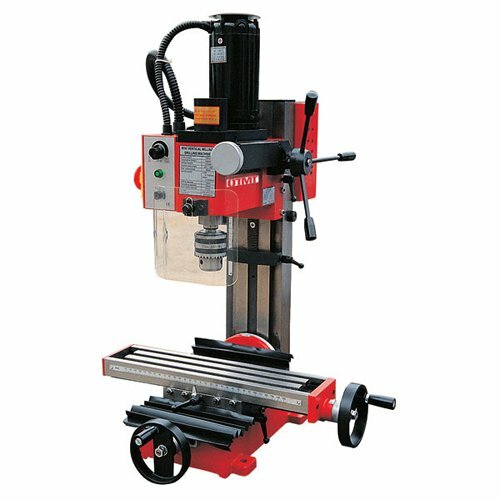 If you are carrying out heavy duty tasks such as milling and drilling metal, you will need a mill with a large worktable to carry out your project comfortably. 3) Weight: depending on the project, consider a mini mill machine that will support the objects being drilled or milled. The heavier the base, the more weight it can hold. Weight also affects the vibration of the mill, the heavier it is, the fewer the vibrations. Vibrations are obnoxious when you are trying to be as precise as possible. 4) Additional feature: features such as a digital display for speed or an easy push button to control speed are added to make work easier. Always look for a mini mill machine that will make your project fun and easy to carry out. Some features, however, don’t increase productivity or precision. 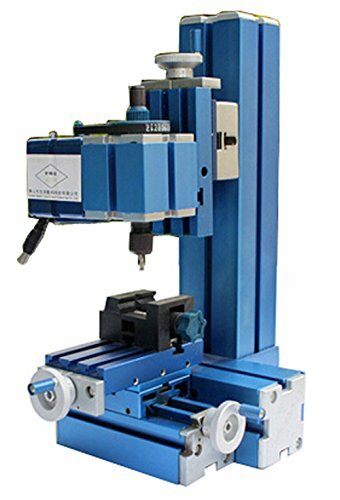 5) Type of the milling machine: there are three common types of milling machines, i.e., vertical milling machines, horizontal milling machines, and Computer Numerical Control (CNC) machines. Always choose the one that works best for your project. 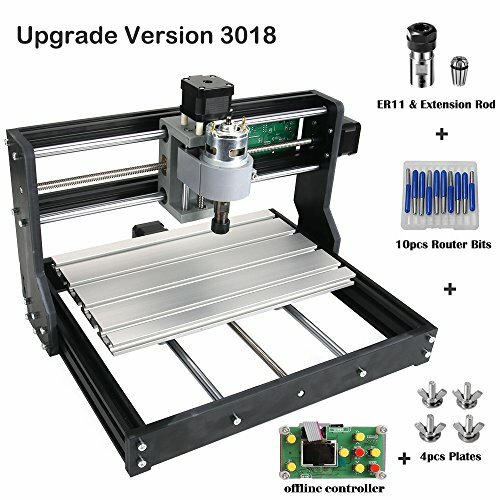 Which is the perfect mini mill machine for me? Always choose a mini-mill that fits your required needs. In this article, we have reviewed a wide range of mini mill machines each with unique uses and power. For example, the CNC 3018-Pro is excellent for engraving plastics and PVC but doesn’t engrave metallic objects. Choose a milling machine that works well for your project. Which is better, electric or hand-cranked milling machine? Electric mini-mills are better than hand-cranked mini-mills because they make work easier. However, hand-cranked mini-mills can still be used if the projects being carried out are small. 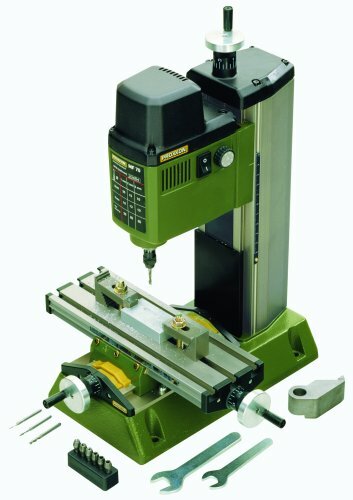 What are other types of mini mill machines available? The above mentioned mini mill machines are the most common, but there are a few others which are rarely used. These include the fixed bed, universal and planner milling machine. Is a digital readout screen necessary? A digital readout screen gives you accurate feedback on the movements made by the milling machine. They make the work more relaxed and precise. However, they’re not necessary because most mills have dials that carry out the specific tasks. The use of milling machines in workshops and homes is becoming more popular as it allows us to carry out activities that can otherwise be performed only in an industrial setting. Choosing the right machine for your project can be quite tricky especially for those who are not familiar with such tools and for this reason; we reviewed the best mini mill machines in the market for you. Always take a look at what you should consider before buying any mini mill and focus on each feature to ensure it’s of benefit to your project. If you’re looking to do something small that doesn’t require significant cuts, go for a small mini mill. If it’s for frequent use or big cuts, go for a bigger mini mill machine.